So remember how I said that I wasn't going to do any cuts because I had to keep the garage clean? Well we didn't end up having our community garage sale so I decided that I couldn't possibly wait a few more weeks before diving right into this puppy. So as you remember, I already had my main pieces of wood cut to size at Home Depot, next step was to start sketching out the boundaries for my initial cuts, I started with cutting out the frame work for the raised bits out of 1/4" mdf. I cut out the main frame. 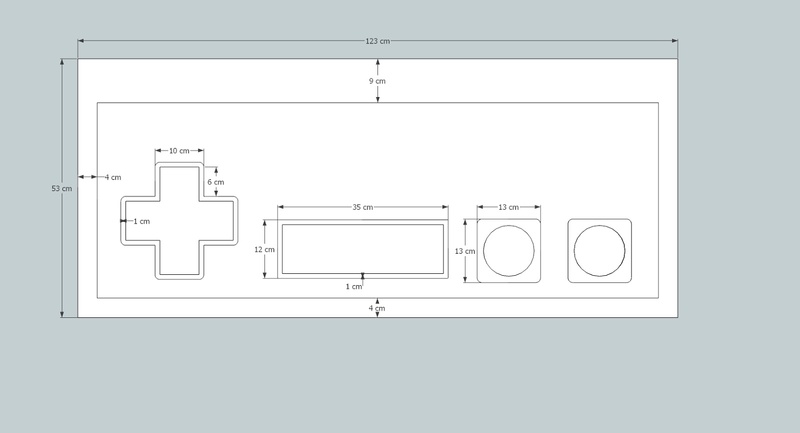 Then all the little panels for the buttons (d-pad, select/start, B, A). 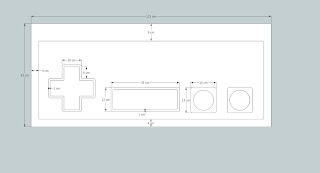 And then I sketched out all of the measurements onto the main 3/4" mdf panel. After sanding and finishing the frame bits, I glued the B & A pads onto the main panel and clamped them to dry. Then I used a 10" hole saw to cut out each button, filled the hole, sanded, sanded, sanded, and well, sanded some more! Now I'm working on cutting out the rest of the buttons and finishing them so they are prepped and ready for painting.